The Logical Controller II: The brain that makes it easy! We've developed the Logical Controller II to provide accurate weight measuring for a wide variety of free flowing materials. With our proprietary software and state-of-the-art micro processor technology, the Controller is the "brain" of our highly adaptable and cost-efficient scales. The controller is accurate down to .001 lbs, or 1 gram, and it can handle weights up to 75 lbs. The controller can set itself up and automatically learn the characteristics of your product for maximum speed and accuracy. The Controller is a modular, plug-and-play system. In the unlikely event that you should have a problem with your Controller, the solution is only one overnight shipment away. Quick Calibration: Just two steps to perfect calibration: Enter Tare Mode, place known weight on scale, enter the known weight on the controller, and the controller is calibrated to the scale. Menu Based Display: The controller has a menu driven setup system so the steps involved in inputting job parameters is clear and intuitive. Home Key: When programming the controller, if you make any type of input error, simply hit the "Home" key and you can easily start over. Store Up to 99 Jobs: If you're constantly going back and forth from job to job, the controller will store up to 99 different jobs, so switching jobs is simple. All Job Parameters are Saved: In "Auto" mode the controller will store all job variables even when the machine is off. No need to reprogram from job run to job run. Plug And Play: Just plug this controller in and in seconds it is ready to program to your specific job. LED Readout Indicates Accuracy of Weight: Provides a visual indicator of the accuracy of the weigh-fill. Green means the weight is within the tolerance you've programmed. Red LED means the weigh-fill is off weight. Auto Dumping Feature: Set the controller to "Auto Dump" and when the right weight is reached, the machine will dump the material without you having to trip the foot switch. Reporting Feature: After 5 machine cycles, press 9 and the readout will show the final weights and cycle time for those 5 cycles. This gives you a visual readout of the accuracy of the machine setup. Our exclusive SMART Mode Controller gets you filling product in a matter of minutes! 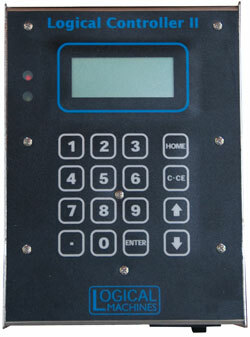 To download information on the Logical Controller II (PDF), click here.